What a wonderful promise from God! The Bible teaches that God has promised to guide the believer unto death. The word guide in the Hebrew is, nahag, meaning, “to drive, lead, guide, conduct.” Carefully notice that the word “guide” does NOT mean to force or compel. God has promised to lead us through this life; BUT He will not force us to do the right thing. Psalm 46:10 says, “Be still, and know that I am God...” Unlike the Devil's crowd who allure their victims with flashing neon lights, God does not force Himself upon mankind. Man has a freewill. God didn't force Noah to build the ark; but rather, Noah built the ark by faith in the Lord (Hebrews 11:7). God didn't force David to fight Goliath; but rather, David fought Goliath by faith in God (Hebrews 11:32). Genuine faith is dynamic, i.e., it makes things happen. Passive faith is no faith at all, but mere optimism. Obedience to the Word of God is faith. 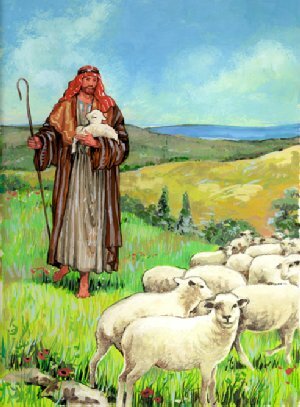 John 10:11,27 state... “I am the good shepherd: the good shepherd giveth his life for the sheep... My sheep hear my voice, and I know them, and they follow me.” Do you see, we are the sheep and Jesus Christ is the Divine Shepherd who guides us. God has promised to guide the believer throughout life, if we will be led by the Spirit of Christ through the Word of God. What a Savior! It's important that we do our part and then just rest in the promises of God, trusting the Lord to do His part in His own unique ways and time. Proverb 3:5-6 teaches to trust upon the Lord, lean not unto our own understanding, and to acknowledge God in all our ways. The Hebrew word for “acknowledge” is yawdah and means, “A primitive root; to know (properly to ascertain by seeing).” It means that we ought to seek God's opinion in every decision of life. Interestingly, the Bible never tells us to SEEK God's will in our life; but rather, to KNOW what the will of God is from the Bible. This is why Jesus commanded every Christian in John 5:39... SEARCH THE SCRIPTURES!!! What does the Bible teach? The Holy Spirit guides us with the Holy Scriptures. Jesus said in John 5:40... SEARCH THE SCRIPTURES! We cannot reasonably expect God to lead us if we are unwilling to study the Bible. So many people spend their lives pursuing “God's will” to no avail, because they remain ignorant of the Scriptures. How can we know God's will if we refuse to know God's Word? The Bible is God's instruction manual for humanity. John 16:13 states, “Howbeit when he, the Spirit of truth, is come, he will guide you into all truth... Sanctify them through thy truth: thy word is truth" (John 17:17). The Holy Spirit NEVER guides us contrary to the Word of God. Many people today are being deceived by a host of demonic psychic mediums on TV, who speak about “spirits”; but they know not the Holy Spirit of God. Literally, millions of people are seeking spiritual guidance from imposters like John Edward, Sylvia Browne, Char Margolis, James Van Praagh, Oprah Winfrey, and Dr. Phil. These are all Modernists, who speak about God; but it is not the God of the Bible. They speak about spirits; but they are familiar spirits (i.e., demons). Any mention of spirituality or spirits that exclude the Word of God is Satanic! Keep this thought in mind. 2nd Corinthians 10:5 states... “Casting down imaginations, and every high thing that exalteth itself against the knowledge of God, and bringing into captivity every thought to the obedience of Christ.” Do you ever hear the psychics talking about obedience to Christ? No. of course they don't. They are sinfully arrogant and proud, exalting themselves against the knowledge of God, i.e., the Word of God. New Age is a deadly poison, which has infiltrated and infested American TV, books, magazines, movies, and school curriculum. The basic idea of New Age is that there is NO actual Person called God; but rather, God is merely the energy of life, the “force” behind everything, and a light which can be reached through any sincere attempt. New Agers reject the Biblical teaching that Jesus Christ is the ONLY way to Heaven (John 14:6). Thus, New Age is a lie of the Devil (1st John 2:22). Many occult practices are rooted in New Age philosophies, including reincarnation. There are many things which I do not understand about God, such as why children are allowed to suffer. I realize that man is to blame, and sin is the culprit; but if I were God, I could never allow a child to suffer. However, I am not God, thankfully, for I would likely destroy half the population, and I would start with SIN CITY Las Vegas! God is so longsuffering and patient towards mankind; but God's patience will come to an end during the Tribulation Period (Matthew 24:3-28), and at the Great White Throne of Judgment (Revelation 20:11-15). God is as vengeful (2nd Thessalonians 1:8) as He is merciful (Joel 2:13). We must trust God, and not lean upon our own human reasoning (Proverb 3:5-7). What could we possibly know, having only been alive for a few years? I marvel at the willing ignorance and arrogance of college students, who follow the unbelief of their heathen professors, who seem to have all the answers concerning life; but they are as fools headed for utter destruction (Romans 1:22). It is rebellion against God! The world places God on trial, demanding PROOF of His existence; YET, nature itself is abundant proof of God's Divine Godhead and power (Psalm 19:1-3; Romans 1:20). Go to any isolated pagan people on earth, and you'll find faith in some sort of God. Only in modern civilization do we find men and women who deny the existence of a Divine Creator. It is out of wishful thinking, and not genuine conviction, that there are atheists in the modern world today. Anybody can obey God if they are willing to ACKNOWLEDGE Him. Romans 1:21 states... “Because that, when they knew God, they glorified him not as God, neither were thankful; but became vain in their imaginations, and their foolish heart was darkened.” The word “glorified” means “to acknowledge.” Every child KNOWS that there's a God at some point in their life. As they grow older, they'll either acknowledge God's presence in their life or turn aside after Satan. The sinful world does not acknowledge God, and their glories and accomplishments are empty and meaningless. Their foolish heart is darkened, hardened by sin and unbelief. They are the blind leading the blind. MANY people today are seeking God's direction in their life; but they are foolishly going to the Modernists, the psychics, the so-called “experts,” the talk show hosts, and the greedy televangelists; BUT, they ought to be going to God's Word. The Bible tells us to acknowledge God in all our ways, and not to rely upon our own human understanding. We are to acknowledge God in every area of our life. The Hebrew word for “acknowledge” in Proverbs 3:6 is yada and means “to know” (properly to ascertain by seeing). The word “ascertain” means “after a calculation, investigation, experiment, or study.” Hence we are to investigate and study the Scriptures for answers, seeking God's will in every decision we make in life. The Bible is our field manual. Although we may not be able to find an exact Scripture reference concerning a particular issue, we can usually form a conclusion based upon Biblical principles. Jesus commanded every believer to SEARCH THE SCRIPTURES (John 5:39). For Example: 2nd Corinthians 6:14 teaches, “Be ye not unequally yoked together with unbelievers: for what fellowship hath righteousness with unrighteousness? and what communion hath light with darkness?” Therefore, we know that it is unbiblical for a Christian believer to be unequally yoked together with an unbeliever in a marriage or business partnership. To marry an unsaved person would make the Devil your father-in-law. God is our heavenly Father as believers. If we cannot find an answer in the Scriptures, only then ought we to seek God's will through prayer. It is never proper to seek God's will prayerfully about a matter that is already answered in the Bible. For example: You don't need to pray for God's will concerning whether or not it's ok to marry an unbeliever. 2nd Corinthians 6:14 already gives us the answer, no. For example: You don't need to pray for God's will about becoming a Dallas Cowboy Cheerleader, because 1st Timothy 2:9 commands women to dress in modest apparel. That definitely means, no, to joining the whore team! God has promised to guide the “meek,” that is, those who are willing to be taught and led, docile, cooperative. Psalms 25:9, “The meek will he guide in judgment: and the meek will he teach his way.” Most people don't care what God thinks. If we eagerly study the Bible for God's opinion, and are willing to do as God commands, then He will guide us throughout life as He has PROMISED. Isn't that awesome! So many people today (including many immature believers) sinfully place God on trial, basing their judgment upon their own human, finite, limited reasoning. Notice again in Proverbs 3:5 that we are NOT supposed to lean unto our own understanding. Proverbs 3:5,6... “Trust in the LORD with all thine heart; and lean not unto thine own understanding. In all thy ways acknowledge him, and he shall direct thy paths.” The only opinion that matters is God's opinion. I love the Bible, because it is the thoughts of God's heart to each generation (Psalms 33:11). Hebrews 4:12 teaches that the Bible is able to discern even between our soul and spirit, revealing the true intentions of our heart. The Bible shows us THE TRUTH. I love the Bible because it is pure, honest and truthful about everything. There is no deceit. King David said he mediated in God's Word day and night (Psalm 1:2). That means thinking about the Bible deliberately and consciously, seeking God's wisdom. James 1:5 teaches to pray for wisdom and God will give it to us. Proverbs 4:7 says, “Wisdom is the principal thing; therefore get wisdom: and with all thy getting get understanding.” All of these precious teachings in the Bible go hand-in-hand. If we want God to guide us, then we must have a meek spirit that is willing to submit to God's Word. We must trust upon the Lord and not lean unto our OWN opinions. We must fear the Lord and depart from evil (Proverbs 3:7). God wants to guide us, but He cannot if we are stubborn as a mule and insist upon doing things the Frank Sinatra way, that is, “I DID IT MY WAY” (lyrics from Sinatra's famous song, “My Way”). Sinatra certainly did do it his way, and he's burning in the fires of Hell forever. If we do our part, then God will do His. If we will trust the Lord Jesus, and base all of our decisions upon the Word of God, regardless of our feelings on the matter, then He has promised to GUIDE us!